This is my costume that I made by hand and I am wearing it. It was made with High Density Foam (aka EVA/PVC foam) from Harbor Freight, glued together with hot glue, and then spray painted. LEDs were used to light up the chest and eyes. Total cost of materials was $225 and it took me 6 months to complete. The idea was found from 405th.com and therpf.com. This costume is real!!! I helped him get around the office! This costume is real. I took pictures of it with my own phone. Plus he is my nephew. I saw him build some of it at his house. Awesome! Love the costume! That is a lot of work you did to make that costume. It diffinately deserves some award! Nice job Chase! What a great costume! That is so amazing that it even lights up. It looks like you put in a lot of work. Great job Chase! Iron Man rocks! Best Costume ever! Chase is the man. Long live Iron Man. This costume should win best costume ever time. Awesome costume! 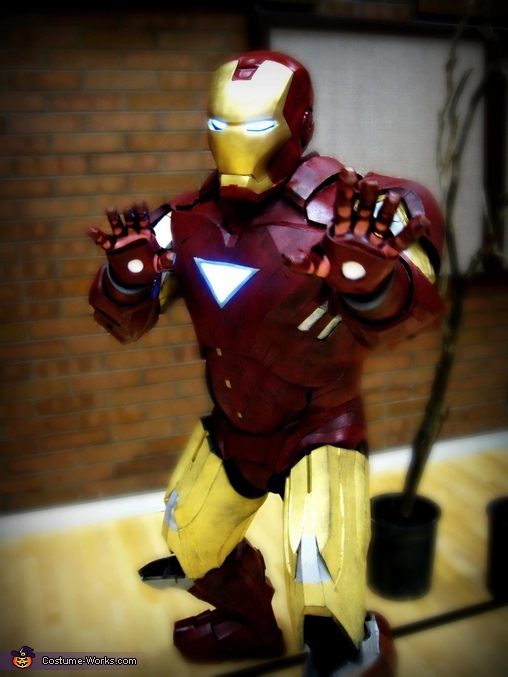 That must have taken tons of time and planning to rig up a costume this sweet! i hope you win, you deserve it! I still can't believe that this costume was HAND-MADE! Your so talented Chase! I absolutely love it! This is the most amazing costume I've ever seen. Chase has spent a lot of time on it and it just looks amazing. Awesome costume! Very creative and clever, it definitely does not look hand made. He did a great job and deserves to win! The helmet is just amazing and check out the light up Eyes and chest piece. The cool part is that it is so lightweight! This is a very awesome costume! You are a very talented boy! This was very neat to see in person! This should win something!